Secures shelf to side wall of closet. Pre-loaded with pins and anchors, no screws needed. Accommodates pole clips and shelf stops in "TotalSlide" system. 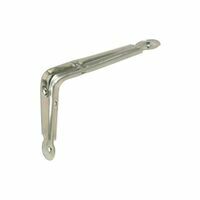 National Hardware Bracket Screw, Series: V152S, NO 7 Screw, 1/2 - 1-1/2 in Length, Truss Head, Phillips Drive, Steel, Antique White Designed for mounting National's #152 brackets. 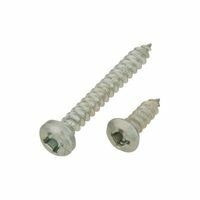 Phillips truss screws, 4 each of 7 x 1/2 and 7 x 1-1/2 inch. Visual-pack. Designed for mounting National's #152 brackets. 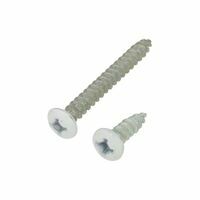 Phillips truss screws, 4 each of 7 x 1/2 and 7 x 1-1/2 inch. Visual-pack. SuperSlide shelving and hardware allows hangers to slide freely on both Fixed Mount and ShelfTrack mounting systems. Hangers slide without interruption. Snaps onto SuperSlide shelf to support hang rod. Use one every 36 in. of hang rod and at each end of shelf and hang rod. 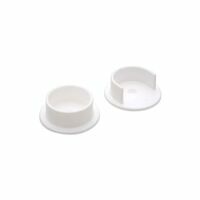 5.75"H x 0.87"W x 3.87"D. Material: Resin Vinyl end cap provides protection from cut end of wire shelving that exposes possible rough edges. Large end caps cover the large rod, 0 gauge, .25"H x .4"W x .4"D. Small end caps are for the 4 gauge wire, .2"H x .2"W x .2"D. Designed to be used with ClosetMaid - Shelf & Rod shelving. 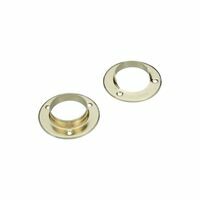 Fits up to 1-3/8" in diameter. Includes one pair of pole sockets and screws. Pilasters for built-in shelving and book case applications. Adjustable on 1/2" centers. 23 gauge high-strength steel, 5/8" wide x 3/16" deep. Fits up to 1-3/8" in diameter. Reinforced design allows for interior and exterior uses. Single screw mounting. Includes one pair of pole sockets and screws. For use with the 80 Series standards. For shelving applications in light industrial, commercial, and residential use. Standards can be mounted to nearly any type of wall. For storage and display applications in retail stores, grocery stores, light warehouses, repair garages, maintenance storage, business office storage, and residential storage. Reinforced brackets lock into slotted standards for strong, secure weight-bearing support. Fully adjustable in 1" increments. 16-gauge cold rolled steel construction. Tested to meet or exceed ANSI performance standards as established by BHMA. For use with the 80 Series standards. For shelving applications in light industrial, commercial, and residential use. Standards can be mounted to nearly any type of wall. For storage and display applications in retail stores, grocery stores, light warehouses, repair garages, maintenance storage, business office storage, and residential storage. Reinforced brackets lock into slotted standards for strong, secure weight-bearing support. Fully adjustable in 1" increments. 16-gauge cold rolled steel construction. Tested to meet or exceed ANSI performance standards as established by BHMA. Accepts a 1-3/8" diameter standard wood pole. 2-3/16"OD x 3/4" overall. Includes one pair of pole sockets and two No.8 x 3/4" Phillips flat head screws. For use with the 80 Series standards. For shelving applications in light industrial, commercial, and residential use. Standards can be mounted to nearly any type of wall. For storage and display applications in retail stores, grocery stores, light warehouses, repair garages, maintenance storage, business office storage, and residential storage. Reinforced brackets lock into slotted standards for strong, secure weight-bearing support. Fully adjustable in 1" increments. 16-gauge cold rolled steel construction. Tested to meet or exceed ANSI performance standards as established by BHMA. Pilasters for built-in shelving and book case applications. Adjustable on 1/2" centers. 23 gauge high-strength steel, 5/8" wide x 3/16" deep. Designed to fit into the fast mount standards, load tested to 100 lbs. Covers up pole ends, keeps hangers from sliding off, friction fit. For use with 1-1/4" diameter pole (except 0023 uses 1" diameter pole). For use with cabinets and storage cabinets with glass shelves. 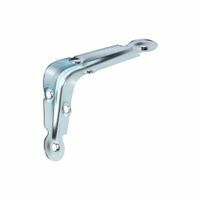 Allows installation of 2 shelf and rod brackets to the wall and 1 shelf to the brackets. 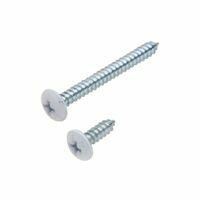 Four 1-1/2" pan head screws for mounting brackets to the wall. Four 3/4" pan head screws for mounting shelf to the brackets. For best use install in wall studs. For use with 108 shelf & rod bracket.